This creamy, rich fudge is lightened by the marshmallows. The fudge will keep, uncut, in the refrigerator for 1 week, tightly wrapped in aluminum foil. 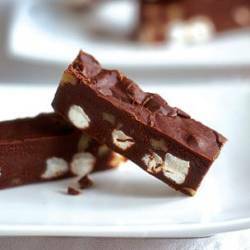 Cut into bars or squares before serving or packing into gift boxes. Makes a great holiday gift. Lightly butter an 8-inch square pan. In a large, heavy saucepan over medium heat, combine the butter, brown sugar, granulated sugar, corn syrup, half-and-half and salt and bring to a boil, stirring constantly. Using a pastry brush dipped in hot water, brush down any sugar crystals that form on the sides of the pan. Boil for 2 1/2 minutes and then stir in the chocolate until melted and well blended. Continue to boil, without stirring, until a candy thermometer reads 234°F, 7 to 10 minutes. Remove from the heat and let cool until almost room temperature, or 110°F on a candy thermometer, about 15 minutes. Using an electric mixer, beat the fudge until the color dulls and the fudge is creamy, 2 to 3 minutes. Stir in the walnuts by hand. Sprinkle the marshmallows in the prepared pan and spoon the fudge over them. Lay a piece of plastic wrap across the surface and, using your hands, press the fudge down into the marshmallows. Remove the plastic and smooth the surface of the fudge with a spatula. Cover the pan with aluminum foil and refrigerate until firm, about 6 hours. Cut into 2-inch bars, or any shape desired, to serve or give as a gift. Recipe adapted from Williams-Sonoma Holiday Entertaining, by Georgeanne Brennan (Oxmoor House, 2007).